I’ll preface my review with a warning to prospective readers that I can be obsessive about details and my day job entails finding design flaws. This review will be long. If you’re interested in purchasing this saw, you may find value in pouring over the details. Otherwise, you’ll likely be bored out of your mind. The bandsaw buying process was a very long and arduous one for me. I’ve always felt that the newer European-style saws to be superior yet the choice of saws with both big resaw capacity (>10”) and a small footprint are pretty dismal. The Rikon 10-325, Grizzly 0457, and Laguna LT14 series are probably the best candidates except none of them are available in Canada! Actually, the Laguna is now available but the pricing, coupled with the lack of standards approval make it less appealing. 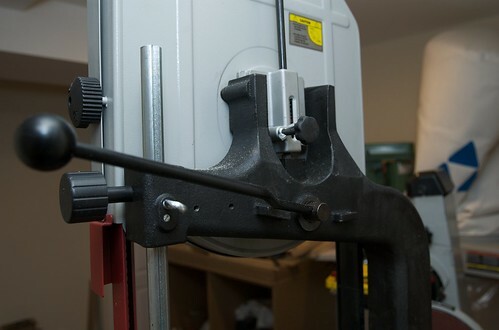 I initially set my sights on the SteelCity 16” Industrial Bandsaw but it turns out that saw was relegated to the history books along with the Dodo and finding a store that carried one within a 100km radius proved pointless. Turning the clocks ahead 3 months, the replacement 50130 saw arrived from the factory. I was told to keep the base/motor assembly and to package up the actual saw. True to their word, SteelCity came by one day, and delivered the 50130 and took away the 50100 with no questions asked. I had a nice conversation with Terry (the regional sales manager who dropped the saw off himself) and shortly after he departed, it was off to the races once again. It’s a pretty impressive saw on paper and if SteelCity’s reputation is any indication, this saw should be an absolute winner. Let’s see if this is the case. The saw’s fit and finish, for the most part, is excellent. The components are all nicely packaged, screws sorted, and the paint job is well done. The granite components really are quite nice. There is little concern for the table warping or rusting which is good. 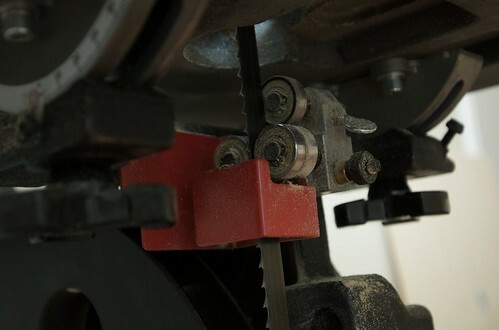 The bottom of the table is also flat which means clamping things is very convenient. There is absolutely no doubt that the granite wheel yields greater angular momentum because it takes much longer for the saw to stop. If cast iron helps the saw resaw better, then certainly the granite will be better. The included mobile base saves you from having to purchase an external one which is good. It is, however, a two-fixed, one swivel system so maneuvering requires you to understand how to parallel park a car. The fixed work light included with this saw is vastly superior to the magnetic base one that came with the 50100. The magnetic version didn’t have enough holding power to keep the light in position most of the time and it had such a large footprint, there wasn’t a whole lot of choice on where to actually mount it. 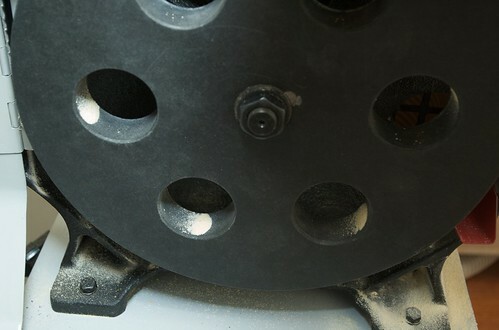 The saw has a cast 4-in dust collect port which is better than the 2.5-in ports on some of the other cast iron offerings. The saw is capable of operating at two speeds, 1500sfpm and 3000sfpm. 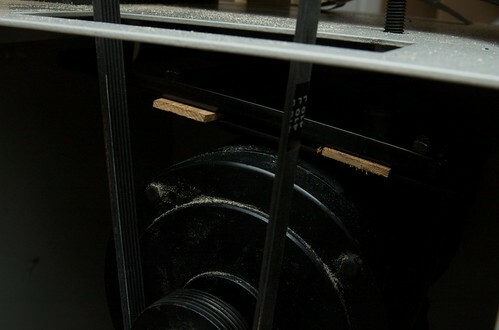 This is accomplished by moving the belt on a pair of stepped pulleys much like on a drill press. The trunnion on this saw is nice and beefy. One many other 14-in offerings, the table supports are very soft and even applying a moderate amount of pressure causes movement of the table. This is not the case with this saw. 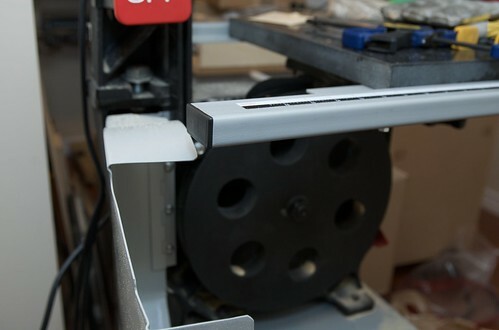 The saw has a quick-release lever for de-tensioning the blade. 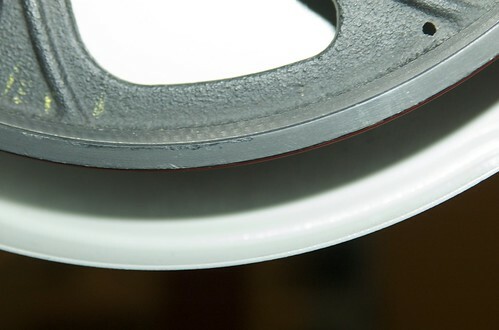 On the 50100, releasing the tension would allow the blade to be changed whereas on the 50130, even de-tensioned, there is still enough tension on the blade to prevent you from being able to change blades. 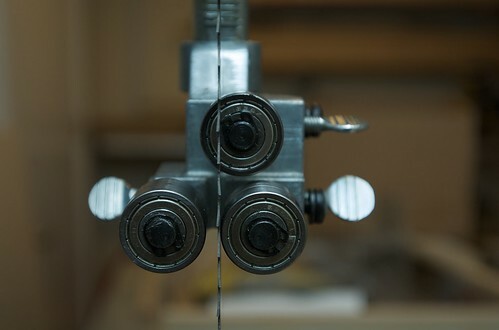 You must, as a result, crank the tensioner down until the blade is relaxed enough to change. Unfortunately, with all that the saw has to offer, there are some warts as well. In fact, there are many warts. 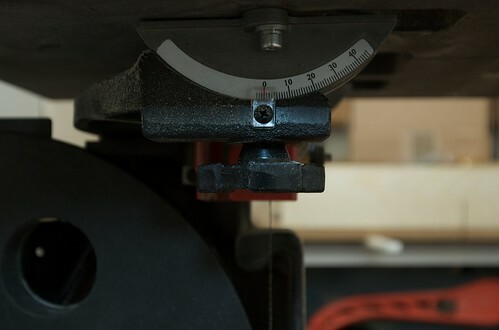 As this saw is based on the venerable design of the old Delta 14in bandsaw, it invariably suffers from some of the same shortcomings. You would think that after 40 or 50 years of continuous “refinement” they’d be able to improve upon the design enough to make the saw feel a little more contemporary rather than like the Ford Model T. Many of the comments that I make henceforth are likely applicable to many Delta copies. Nevertheless, since SteelCity seems like a company that’s willing to try new things and to improve upon existing designs, I’d expect them to pick up some of the low hanging fruit as they pass Go. The first problem with this saw is that it suffers from usability/ergonomic issues. Let’s start with the blade guard. 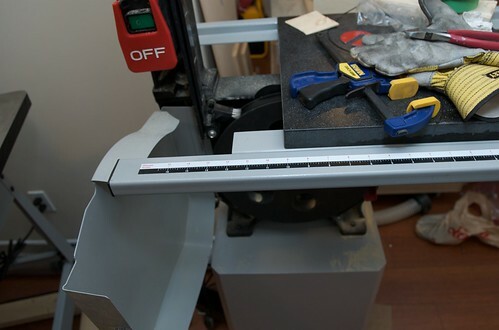 The design of this blade guard is such that it mounts to the guide assembly and folds around the front of the guide assembly shielding the user from the blade. Almost all 14in bandsaws have guards this way except for some reason, SteelCity elected to use a guard that blocks all the way to the bottom of the guide bearings. 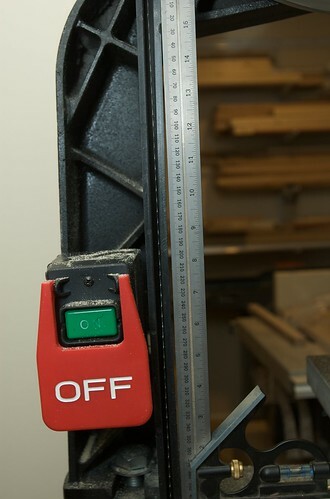 The average human is about 6’ and the usual recommendation is to have the guides set about 1/4” above your workpiece. 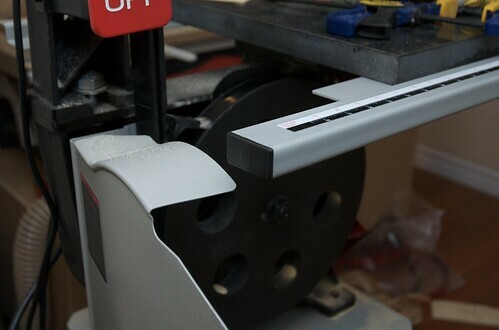 It doesn’t take long before you realize that you can’t see enough of the blade to guide the workpiece in making accurate cuts (unless you stoop down even lower). With the 50100 riser kit guard, it was “tough luck.” With the 50130 SteelCity “improved” the guard by putting in two small plastic windows to help the user see. I’ve worn glasses the vast majority of my life but these plastic windows make me feel like I need to have corrective eye surgery even with my glasses on. Surely they didn’t think that looking through Coke bottles was going to help the problem any great amount? Not to mention that as you cut, sawdust tends to stick to the plastic and you soon end up with a graffiti canvas…the kind where people write “wash me”. Fortunately, the little plastic windows are removable though their absence only improves visibility by a fraction. Imagine cutting with tunnel vision. Next up, the blade guard…again! My PC chassis have been tooless for quite some time. The good news is that the SteelCity is tooless as well, but only for the bearing adjustments. Removal of the blade guard requires the help of your friend Phillip. A couple of knurled screws (positioned slightly differently, of course) would have made it fully tooless. Of course, no one would ever want to take the blade guard off unless one wanted to change the blade. It turns out that removing the blade with the guard on especially with wide blades (i.e. 5/8”, 3/4”) is extremely difficult. In fact, darn near impossible. The nice fence rail is so long that even with the door wide open (yes, 90 degrees is as wide as it goes), there’s hardly a gap for you to pass the blade through. In fact, for wide blades, it simply can’t be done. Instead, you have to tilt the table (unless you prefer removing the fence rail). that lower blade guard will pretty much hide whatever the knob doesn’t. Of course, you can peer down the hole in the table but, trust me, it’s dark down there. A more minor quibble has to do with the work lamp and the quick release lever. 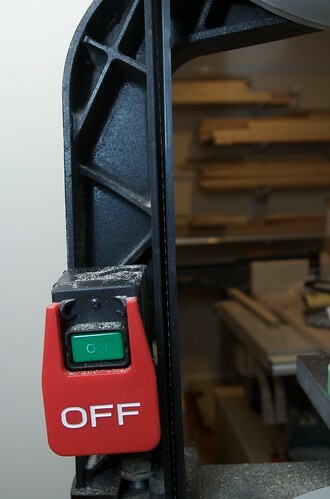 SteelCity chose to use a quick release mechanism that rotates almost 180 degrees. That’s fine. However, the lamp is mounted along the trajectory of the quick release lever. The following photo doesn’t have the lamp mounted but the two screw holes are where the lamp would mount. At least the lever doesn’t hit the mounting bracket of the lamp but you typically have to move the lamp out of the way to engage and disengage the quick release mechanism. Also, the lamp requires its own plug. It would be very nice if it could just tap its power off of the same line feeding the saw. Going back to the guides, I fail to see why the guide bearings have to be adjusted fully independently. The eccentricity I can understand but the amount of thrust should somehow be locked together. Now I’m not claiming that the Ridgid BS1400 is a better saw but even it has a micro-adjusting screw that moves both left and right guide blocks in tandem. This is especially true of the lower guide assembly where it’s hard to see how far out the left bearing is relative to the blade. I won’t even complain about the fact that the thrust bearings do not have micro-adjusting screws (that are present on even the lowly BS1400). 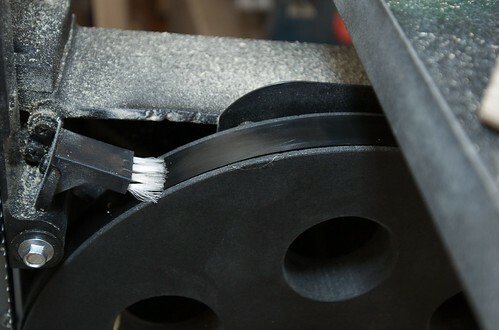 As with most 14in bandsaws of the cast iron variety, the 50130’s guide post is not perfectly parallel and in lateral plane with the blade. 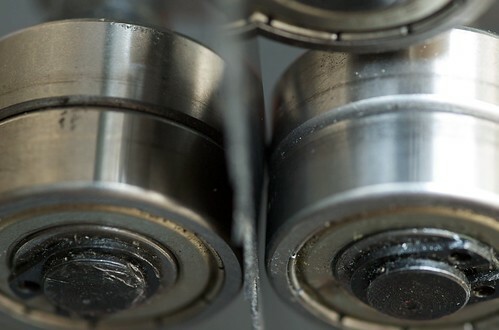 This means that every time you move the guide up or down, you can expect to have to readjust the bearings. It’s annoying but it’s not a show stopper and I’ve stopped worrying about this in light of the “Ugly” issues below (which are of far greater concern). It’s time now to embark upon the truly nasty aspects of the saw. The following section will be long and detailed and if your stomach has already turned, then I suggest you close your browser down now. Otherwise, proceed at your own risk. and it’s clear that the guard is bowing to the left (which is why the blade is riding so close to the right wall). 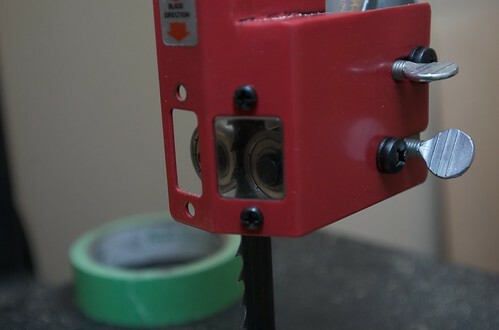 I’ve tried loosening the bolts, pushing the guard straight while tightening down the bolts again in hopes that it would retain its shape but to no avail. Now I’ve stuck a couple of shims between the power switch and the guard to make it straight. To the more serious issues now…. 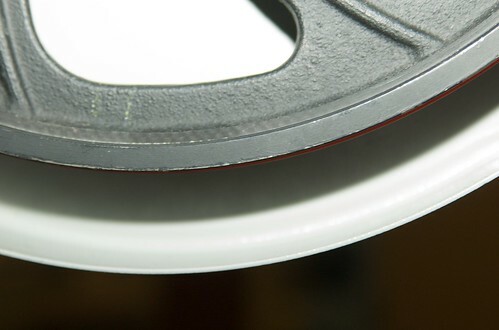 When you rotate the assembly to the right, the bearing edges are no longer parallel to the blade. 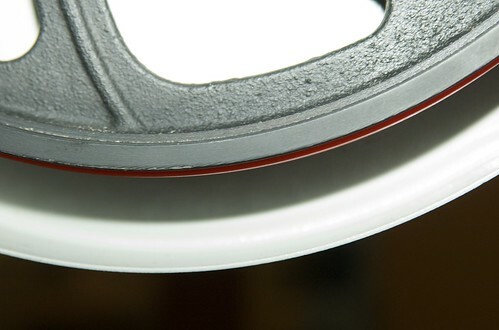 You can see that for the right bearing, the back touches the blade but there is a gap at the front. Conversely, the left bearing touches the blade at the front while there is a gap at the back. The bearing edges are quite far from the gullet of the blade even though the shaft that holds them has been fully extended. 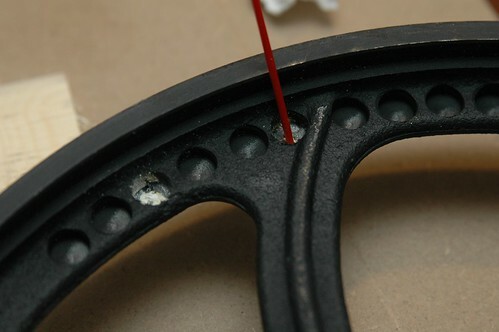 I’m uneasy about drilling into the cast iron wheel so I’ve since elected to attach wire to the wheel in hopes of balancing it out (though it’s made minimal improvement only). 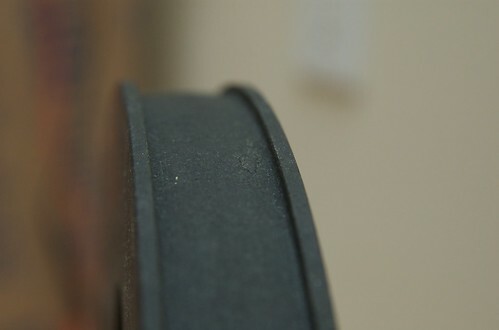 I’ve told SteelCity about the bad wheel and though initial correspondences indicated they would replace it, they’ve dodged the issue in subsequent correspondences. In addition to the vibration, I noticed that the blade was oscillating quite violently. This led me first to measure the “out of roundness” of all wheels and tires. 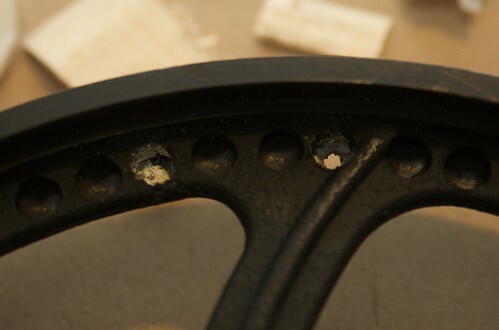 What I discovered was that the granite wheel had all sorts of lumps in the crown. It’s difficult to see but it’s either some sort of epoxy or glue. These photos show the tire actually lifting away from the wheel. I remembered how easy it was to take off the tire and suspect that maybe the tires were slipping, building up charge, and then discharging through the blade. I drew a hash line across the tire and onto the rim and then ran the saw. Sure enough, after power-down the hash line on the tire was no longer registered to the hash line on the rim. 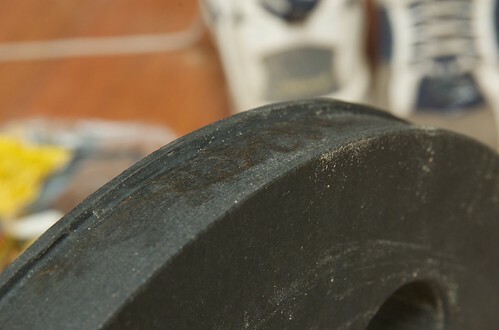 As such, I ordered a new set of neoprene tires from R&D Bandsaw and there is no longer any slipping (and no sparking). Ironically, I haven’t done much real cutting with the saw because I’ve spent all my time trying to fix the saw. The guide assembly issue still irks me but I’m no longer content throwing my own money at the problem. I believe I’ve repaid SteelCity’s graciousness with my own time and money. As ill set up as the machine is, it at least cuts without any drifting (at least using a 5/8” blade). I haven’t had a chance to do any serious resawing but will hopefully follow-up with a post when I get around to doing that. It should come as little surprise that I give the saw such a mediocre rating. I don’t believe anyone should have to waste such copious amounts of time and money on a new saw. I’m ambivalent about SteelCity’s customer service (they’ve been exemplary on one hand and rather abysmal on the other). I think the granite components have merit but execution on the other parts of the saw is weak. I’m disappointed that SteelCity didn’t capitalize on the inception of its new saw by addressing all the shortcomings I’ve stated in my review. 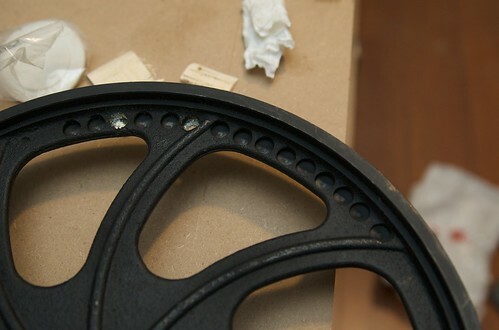 Save for the granite, I have to say that the 50130 is just another run of the mill 14” cast iron band saw. Perhaps SteelCity is content playing the status quo card but I suspect that if that’s the case, they’ll always be playing second fiddle to the field if they’re playing at all. A few updates here. SteelCity did get back to me eventually. They did have some miscommunication internally with the regional rep assuming that a service technician had come out and resolved the issues when, in fact, that person never received the email about my case. SteelCity did follow-up some weeks later and then promptly sent someone to look at the saw. They then replaced the upper wheel and the upper guide assembly. I believe the new upper wheel is better but the upper guide assembly, I’m afraid, likely isn’t going to be rectifiable. The technician who came to look at my saw basically did the same thing I ended up doing which was to rotate the upper guide assembly a little bit to allow for more lateral clearance for the right-most bearing. Of course, the bearing surface isn’t perfectly parallel to the blade face but for now, I’m going to have to live with it. On a performance note, I would have to agree with most reviews that at least the saw has considerable cutting power. I’ve not had a chance to resaw to the full capacity yet but 6” QSWO seems to be no problem whatsoever. The cut quality is certainly acceptable and there is, as mentioned previously, negligible drift. This is with a 5/8” R&D Little Ripper blade. With respect to the blade guard blocking the view, I was told that this was a requirement enforced by the standards associations (CSA? UL?). This may be true but I have to wonder why few other companies seem to be subject to this rule. SteelCity has certainly worked hard to rectify the situation and hasn’t really forgotten the little customers so I do have to give them kudos for their service. Hopefully, SteelCity will do well and thrive despite the corporate changes that have taken place. Perhaps if they weather the economic storm, they’ll make version 2 of this saw a much more formidable contender in the 14” bandsaw category. 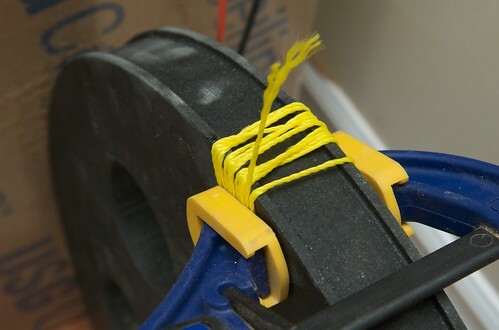 Running a piece of string showed a gap between the two inner rims which shouldn’t ever happen (ideally). and im glad i dont need a new saw . ive got 6 bandsaws already ! 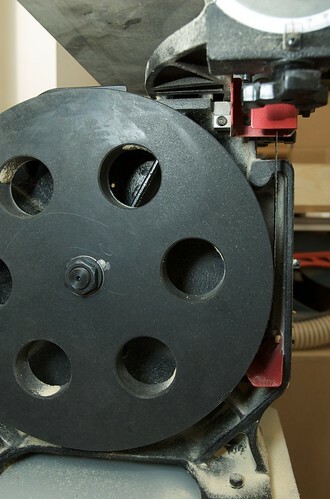 Great review Charlton…....but sad that the new saw turned out to be such a hassel. A thorough (if not overly nit-picky) review. It is apparent that you got a lemon, something very uncommon for Steel City. Why you haven’t returned the saw to Steel City to deal with all these issues under warranty is beyond me. 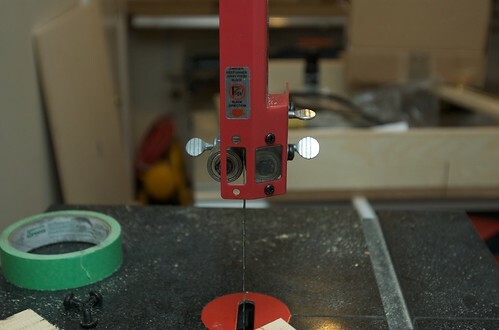 The saw has a great 5 year warranty and 10 yrs on granite parts. Instead you’ve tryed to fix everything yourself, likely voiding the warranty. I own the same saw and have NONE of the issues you have with the upper bearings/guide/wheel alignment/balance/vibration etc. The only point that my saw also has is the cheap plastic left blade guard on the left. Yes the blade rubs it. Yes it could have been better. 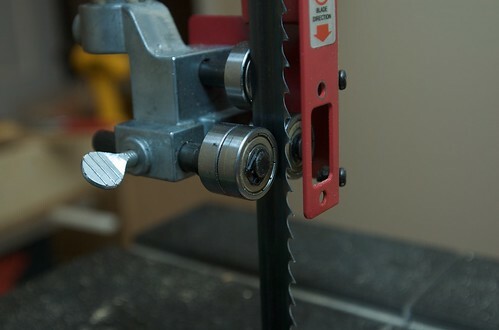 But a simple shim holds it in place and now the saw runs perfectly. Cuts like a dream. Thanks Charlton for a great review. You just saved me from a really bad purchase. Now, please buy a Grizzly GO457 and let us know what you think. -- Measure twice, cut once, buy extra stock. thanks for the review. well put, lots of info, and in a very enjoyable manner. sorry you had to go through so much pain and misfortune. this really shouldn’t be how things work. While I have only the model 50100 with riser kit which this review started with, and not the 50130, I also believe as someone else stated above that you possibly got a lemon. I would think it possible that I got lucky in getting a good saw, but since I haven’t seen any other bad reviews, I have to believe for now that my good experience is the norm. I can’t speak for the newer model, but I have almost no vibration in my saw. 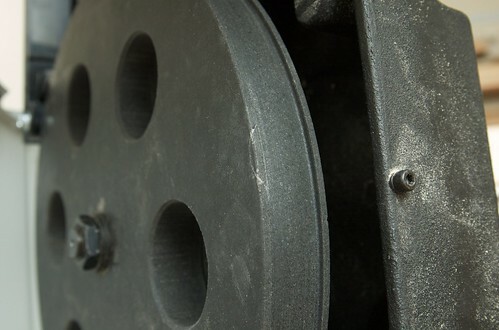 Some of the features are common to both saws, such as the roller bearings. 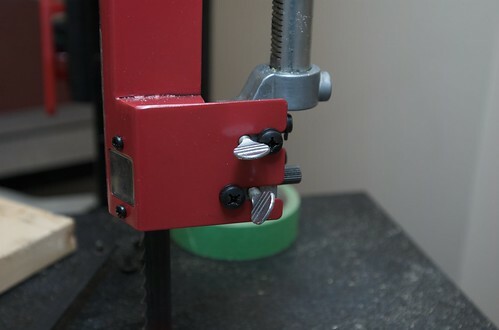 I find the bearings easy to see and easy to adjust (for me) and have not had the problem with the alignment being out of the range of the adjustment. I would highly recommend the 50100 to anyone, and they are still available. I do think I got a lemon because another member has the 50130 and he thinks it’s perfect. Part of the reason I went down this whole rabbit hole is because when you get two lemons in a row, you start to think that maybe it’s your ability to set things up (granted the only thing to really set up is the belt). 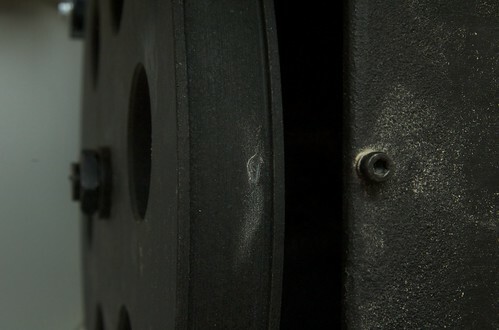 DaleM, I believe SteelCity has received complaints about excessive vibration when the riser kit is installed. In one case, they replaced the person’s saw with the 16” saw (since the 50130 wasn’t available). I don’t recall whether the knob blocks the view of the lower guide assembly on the 50100…the trunnion is a bit different to accommodate the weight of the granite table. Rileysdad, I would love to try a G0457 but as I mentioned, you can’t get them here in Canada and the Canadian equivalent (Busy Bee) just doesn’t have the same selection and quality that Grizzly seems to have. Thanks Charlton. I do have the riser kit installed. It sounds like a quality control problem since it appears some of these saws never should have made it to the buyers. I’m glad I got one of the good ones, because when it works the way it’s supposed to, it’s a good saw. Sorry to hear you weren’t so fortunate. No worries, Dale. 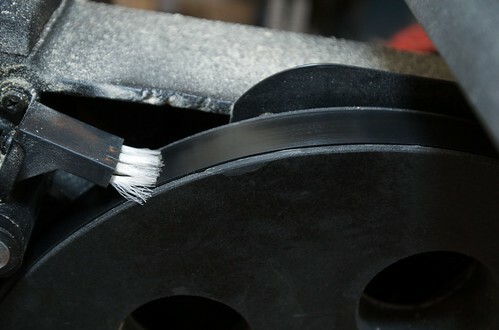 The vibration is bearable now and as long as I can get the saw to cut well, the guide issue can be overlooked. Thanks for the review, when I’m in the market for one of these, I’ll definately think twice about this brand. Thanks for the review. I liked the detail, and I can tell you, I feel your pain. I bought a SC granite TS. (posted a review a few weeks ago) and my experience with SC customer service was much like yours. They seemed helpfull initially but after the first couple of conversations, they became non responsive and would not follow up on their promises. If you get lucky and get a good piece of SC equipment from the beginning you need to consider yourself foutunate. I do not see a bright future, if any future, for Steel City. very indepth review, i am glad i just bought thr rikon, no problems so far, knock on wood. Great review of your experiences. Sorry for your problems.